Ermigersh I don't think I have ever eaten so much chocolate in one go before. I hope everyone's Christmas wasn't as fattening as mine, or maybe I do because then I might feel a little less guilty. It is Christmas after all. That should be a good enough excuse, right? 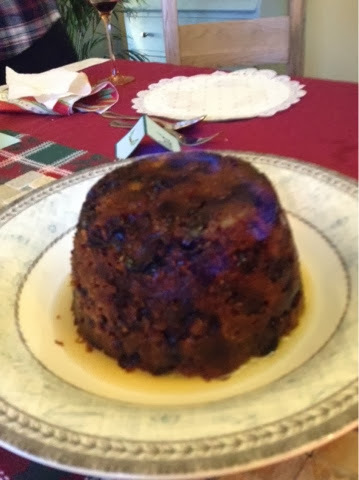 Yep this is our christmas pudding. It looks a bit lonely. Perhaps we should have decorated it a bit, athough that may have caused a few problems when setting it on fire. I am officially tinsled, baubled, christmas caked, turkeyed out! I'm knackered over the whole thing. But new year is almost upon us so resolutions are in sight! Mine is to blog more often and of course try and be healthier. What's yours? I've had some really nice gifts (including Miranda Hart's 'maracattack' on DVD -how brilliant!) and had a good laugh with the family. My Uncle bought my 90 year old grandad a skeleton onesie. Need I say more?! Right now I'm sitting watching a film whilst gracefully nibbling at a piece of chocolate. Lovely. Alright alright I'm scoffing my face with a giant galaxy bar. But still. I've had a truly brillo chrimbo this year! What about you? I want to hear about your Christmasses! What did you get?